Shawn Grady signed with Bethany House Publishers in 2008. He was named “Most Promising New Writer” at the 39th Annual Mount Hermon Writers Conference. He is the author of the novels Through the Fire & Tomorrow We Die. Shawn attended Point Loma Nazarene University as a Theology undergrad before shifting direction to acquire an Associate of Science degree in Fire Science Technology as well as Paramedic licensure through Truckee Meadows Community College. Shawn currently lives in Reno, Nevada, just outside of Lake Tahoe. He enjoys spending time in the outdoors with his wife, three children and yellow Labrador. Jonathan Trestle is a paramedic who’s spent the week a few steps behind the angel of death. When he responds to a call about a man sprawled on a downtown sidewalk, Trestle isn’t about to lose another victim. CPR revives the man long enough for him to hand Trestle a crumpled piece of paper and say, “Give this to Martin,” before being taken to the hospital. The note is a series of dashes and haphazard scribbles. Trestle tries to follow up with the patient later, but at the ICU he learns the man awoke, pulled out his IVs, and vanished, leaving only a single key behind. With the simple decision to honor a dying man’s last wish, Jonathan tracks the key to a nearby motel where he finds the man again–this time not just dead but murdered. Unwilling to just let it drop, Jonathan is plunged into a mystery that soon threatens not only his dreams for the future but maybe even his life. He must race for the truth before the Angel of Death comes calling for him. 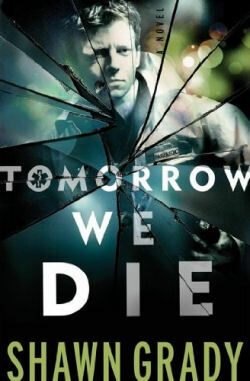 If you would like to read the first chapter of Tomorrow We Die, go to HERE. I have to confess that, on top of Historical and Amish novels, I am a complete and utter SUCKER for medical suspense and dramas! I used to love to watch E.R., House,and, back in the day, Doogie Howser, MD! I also loved the fast paced thrills of watching the real life medical shows. My blood and heart rate was always pumping into overdrive! Reading Shawn Grady’s work for the first time falls into that blood-rush thrilling sensation! LOVED it! From the minute I opened to the first page, Grady thrust me straight into Jonathan’s fast paced environment. I felt myself transform into a paramedic and instead of feeling the pages in my hand, I felt like I was right there beside Jonathan working on patients, all with God by our side. It was such a rush of overloaded adrenaline and mystery! Jonathan had a fast paced life of a paramedic AND a med student but he also had the thrills of being drawn into an unusual mystery, that could cost him his life! I literally turned page after page with a racing heart because I HAD to see what happened next, HAD to feel that next rush of adrenaline! If you love suspense and medical thrillers, then this book is DEFINITELY for you! Five stars all the way with high recommendations! It’s perfectly created with God’s guidance and protection, suspense and mystery, and humor to keep the reader hooked til the end! I can’t wait for more of Shawn Grady’s work! I am making it a MUST to go back and read his first book, Through the Fire!